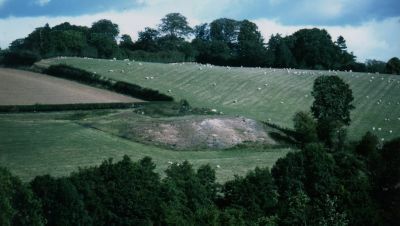 The pits of Llwynymaen are of the same period as the Trefarclawdd pits. One of the proprietors of the Oswestry Old Bank, Mr John Gibbons purchased a portion of the Llwynymaen estate and started this colliery in partnership with Sir Watkin and a man named Ireland.It is known that mining in this area started well before the 1800,s for when the National Loan for combating Napolean was raised in 1798, 140 colliers from the Llwynymaen Colliery contributed £4.0s.6d, and 70 colliers from the Trefarclwydd Colliery £2.14s.6d. The first pit to be sunk was situated on the right or western side of Trefonen Road nearly opposite the entrance to Chain Lane and the cottage nearby was the machine house of the colliery. When this pit was flooded another pit was sunk, east of Llwynymaen. In 1830 the concern was in the hands of another firm Thomas Ireland & Co. and they operated the pit until about 1840 when it suffered the usual fate of flooding. Another name in this firm was David Thomas, whose many interests included a shop in The Cross, Oswestry (later called R&R Hughes & Co). He was a member of the Old Chapel and a friend of Henry Warren, the Morda calico printer. 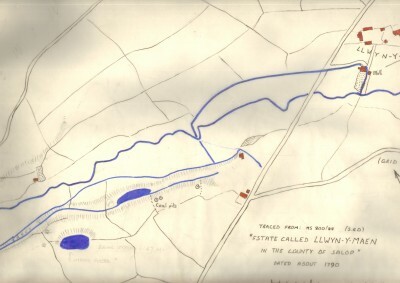 Tracing from a document dated 1791 showing the feeder channels around the Llwynymaen pits. It can be seen that there are three pits at this time opposite the entrance to Chain Lane. 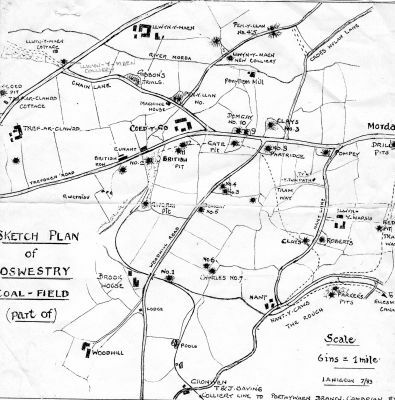 Sketch plan of the Oswestry coal field showing 1st pit sunk opposite Chain Lane with nearby Llwynymaen cottage(Machine house) and later pits to the east of Llwynymaen. 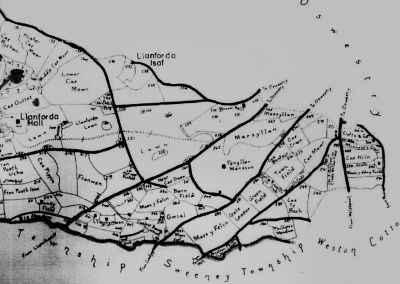 1830,s field mao of Llanforda area showing Llwynymaen coal pit. 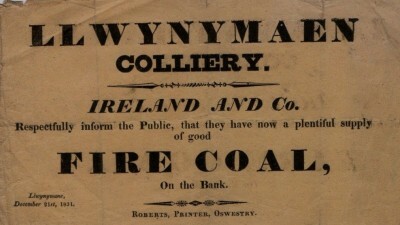 Interesting advert for fire coal dated 1831 by Ireland & Co for Llwynymaen Colliery.. Copy of a report of a tragic accident believed to be at Llwynymaen colliery, date not known. 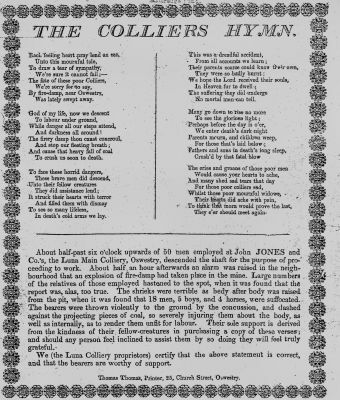 A hymn was produced for sale to collect money for the dead miners families. Further enquiries need to be done to verify the authenticity. 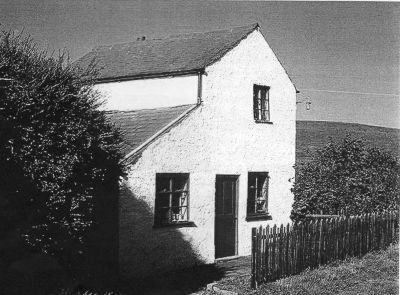 The old machine house, which would have served the mine in Chain Lane and is shown on the sketch plan above. The house is still in Chain Lane and is a very rare example of such a building. Recent photo of Llwynymaen pit spoil heap.